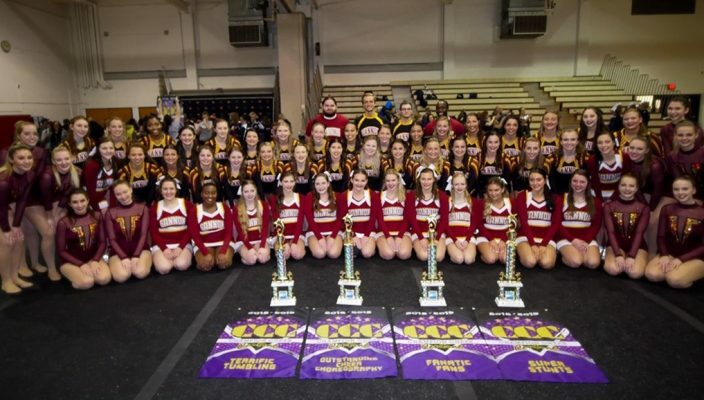 The Gannon University competitive cheer and dance team opened its 2019 season Sunday at the Falls Freeze Frenzy in Sanborn, N.Y.
All of the Gannon units – dance, gameday, all-girl and coed – were competing for the first time this year. The three cheer teams were uncontested, and the dance team finished second behind Robert Morris. The dance team received a final score of 80.2. Robert Morris beat Gannon by less than a point with 81.13 points. In the choreography category, Gannon received 8.067 out of 10 in composition of movement, 8.067 in staging/visual effects and 8.133 for degree of difficulty. In the execution category, the Knights averaged 8.267 for movement dynamics while in the presentation category they averaged 8.133 in communication and 8.667 in suitability. The Knights’ dance team finished with zero deductions. The all-girl team finished with a score of 80.4 out of 90 with specific awards for tumbling and stunting. The Knights averaged a perfect 5 out of 5 for jump difficulty, 4.73 in pyramid difficulty and 4.67 in toss technique. They averaged 9.2 out of 10 for overall effect and 9.47 for choreography. The women lost one point in deductions. The coed team scored 80.73 out of 90 while also claiming a specialty award for best routine choreography. The Knights averaged 5 out of 5 for jump difficulty, 4.73 in pyramid difficulty and 4.67 in toss technique. The team averaged 9.2 out of 10 for overall effect and 9.47 for choreography. The Knights lost one point in deductions. In the gameday squad’s first performance, the team scored 88.13 out of 100. Gannon averaged 9.3 out of 10 for execution of fight song and 9.27 for visual effect in fight song. The Knights also averaged 9.1 for overall effect, 9.077 visual effect in band chant and 9.0 for effective usage of props in crowd leading. The competitive cheer and dance team will be back in action Feb. 24 in the Red Hot Competition in Slippery Rock.